Spring brings vibrant colors, the fresh scent of flowers, and casual brunch dates—and lots of outdoor activity. And there’s no shortage of delightful events and happenings in the city when the trees begin to turn green. Strolling through some of the best parks, enjoying festivals of all kinds, or simply relaxing at a weekend brunch, we have everything you need to enjoy this lovely season. Yes, Spring has finally arrived! 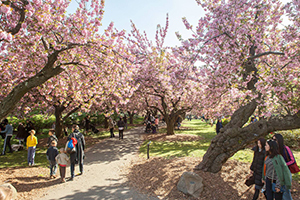 Spring creates an enchanting display of life, as flora and fauna bask in the gentle rays of the sun while the inhabitants of the city emerge from hiding and expose themselves to the many entertaining events happening this spring. 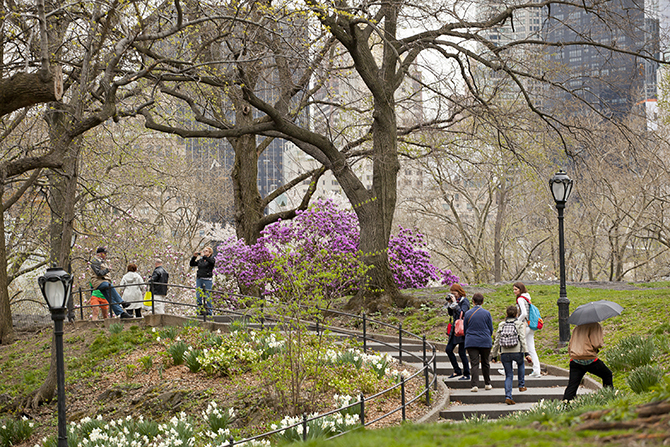 It’s that time of the year where the city is on show, and thousands flock from all over to see New York in full bloom. Hidden in the Japanese Hill and Pond in the Brooklyn Botanical Gardens is a heavenly display of cherry blossom trees. Only in bloom from early April to mid-May, you will want to get in quick before you miss it. This annual celebration of Japanese culture is also on display with over 60 events and performances including an art gallery, mini-flea market and, of course, the picturesque sea of soft pink petals that draws in the crowds. Kids will take part in fun activities such as sword-fighting play, taiko drumming, manga artist workshops and a traditional sohenryu tea ceremony. This year the festival takes place April 29th – April 30th. Info: bbg.org. The 16th Annual Orchid Show is in full bloom once again with the mesmerizing displays of thousands of vibrant orchids. This year’s exhibition showcases a series of installations crafted by Belgian floral artist Daniel Ost. Each living sculpture created is a celebration of the intricate beauty of the orchids. 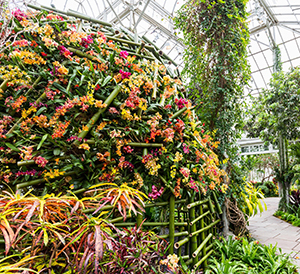 Visitors will experience live music and special performances that pay homage to the orchids. Cash bars will offer beers, wine and cocktails including the dancing lady, a cocktail created by Edible Bronx’s head mixologists while Hudson Garden Grill serves up a pre-show meal and light bites. Whether you are a floral connoisseur yourself or you’re just there for the spectacle, the Orchid Show is for everyone. Info: www.nybg.org. Here is another excellent flower show blossoming this Spring. The Macy’s Flower Show draws on New Yorkers and visitors every year with the floral-filled exhibition at flagship Herald Square store until April 8th. This year’s theme “Once Upon A Springtime” spawns a fantasy world of blooming flowers fit for a princess and her royal family. Visitors will enter a make-believe world, where magic is real and beautiful displays bring to life classic fairytale themes. Stop by to smell the sweet aromas or merely take a step back and appreciate the beauty of nature and its magical essence. Whatever your reason, the Macy’s Flower Show is an enchanting experience for the whole family. Info: macys.com/social/events. Spring brings these delicate beauties to the palm of your hands at the butterfly pavilion in the American Museum of Natural History. Housed in a 1,200 square foot vivarium that simulates their natural habitat, up to 500 butterflies flutter around you creating a truly magical sight. The winding path surrounded by tropical plants and vibrant blossoms guides visitors through the butterfly oasis allowing you and the family to get close with the beautiful creatures. It is truly an enchanting experience to be transported into a magical setting teeming with color and flourishing life. Hanging above are powerful halide lamps to simulate sunlight streaming through rainforest canopies, and the enclosure is kept at an optimum 80-degree temperature. Pupae hang in a case inside the vivarium, giving visitors a first-hand look at adult butterflies emerging from their chrysalises and flying away just moments after adjusting to their new surroundings. After an intimate experience with these spectacular creatures, colorful and interactive displays await you beyond the vivarium. 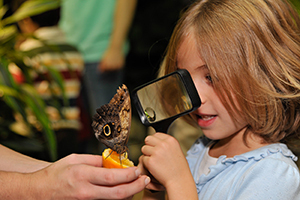 Learn about a butterfly’s life cycle, the worldwide efforts to protect their diverse habitats and a variety of butterfly species in the New York area. Info: amnh.org/exhibitions/the-butterfly-conservatory. It’s time to dust off your sneakers, retrieve your T-shirts from the back of the closet and locate the sunglasses that you had put away for so long. Spring is here and with it comes an abundance of festivals that are not to be missed. 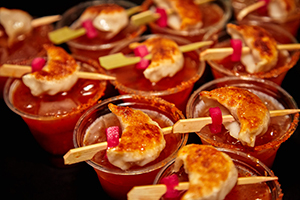 Create unforgettable moments with friends while celebrating one of the most beloved brunch cocktails, the Bloody Mary. Spend hours tasting some of New York City’s most creative and delicious Bloody Marys’ crafted by the finest bars and restaurants. You can wash it down with tastings from over 20 food and beverage artisans. Lunch catered by locals is also available for purchase. While you are relishing all the glorious items in front of you, treat your ears to the sound of a live DJ and the buzz of people conversing on a splendid Spring day. The festival is held on April 8th in the Grand Prospect Hall starting from 11 AM; tickets start at $50. Info: thebloodymaryfest.com. Calling all beer aficionados. 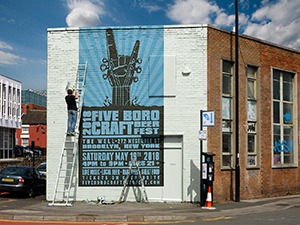 The Five Boro Craft Beer Fest is wholly dedicated to celebrating the liquid gold malt beverage that everyone loves. In its 5th year celebration, the festival includes 50 local and out of state brewers serving over 100 craft beers at optimum temperature—the right way. Along with the countless beer tastings, local restaurants have coordinated to bring guests a variety of delectable bites to go with the many varietals of beer. For entertainment, three different bands will be performing all through the day and night. The May 19th festival runs from 4 to 9 PM; giving you plenty of time to taste your way through some of the best beers you will ever taste, not to mention the appetizing bites. Don’t forget to bring your dancing shoes. This will be a night you wouldn’t want to miss. An all-inclusive ticket includes unlimited 2 oz. tastings from each brewery, catered food and a special gift for each attendee. Doors open at 6:30 PM at The Well in Brooklyn. Info: fiveborocraftbeerfest.com. Every Spring the sidewalks around Washington Square Park are transformed into an outdoor gallery. 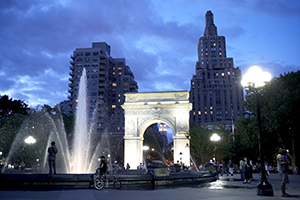 Explore the work of a wide range of artists and craftspeople from the city and around the world in this famous square, where artist Jackson Pollock was inspired to start the art show—now an annual event. Beginning Memorial Day Weekend until June 3rd visitors can peruse the abundance of paintings, hand-made jewelry, metal workpieces, ceramic pieces, photography displays, sculptures and a variety of other crafts on display. This event is great for the family and even doubles as a romantic outing with a loved one. Info: wsoae.org. This world-famous festival brings together visionaries across industries and diverse audiences to celebrate the power of storytelling. 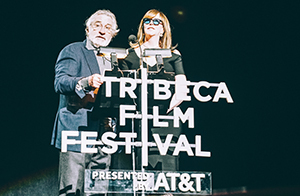 Founded by Robert De Niro, Jane Rosenthal, and Craig Hotkiff, the Tribeca Film Festival is a memorable event worthy of your time. Not only is it an entertaining event, but it also provides the audience with the opportunity to experience remarkable productions from independent filmmakers who aim to leave an impact on their work. This year (April 18th – April 29th), the festival will open with a premiere of Love, Gilda—an intimate portrait honoring comedy legend Gilda Radner. If you are a movie buff, an inspiring filmmaker or just looking for something great to experience, the Tribeca Film Festival is the ideal option for you. Attendees can purchase passes ranging from VIP packages to Awards day pass. Info: tribecafilm.com. Spring has sprung in New York City and that means leisurely strolls downtown, catching the latest design trends at out-of-the-way shops and, of course, taking a break with a relaxing brunch with friends. Jacks Wife Freda American/Mediterranean cuisine sets the tone in a lively all-day bistro, perfect for Sunday brunch with friends. Diners will indulge in savory and sweet items, made from the freshest ingredients. Dishes such as a classic Eggs Benedict or Waffles topped with fresh fruits, maple syrup, and whipped cream are the type of delectable items you can indulge. The simple setting offers a dynamic atmosphere with plenty of light making it the perfect backdrop for a stunning Instagram post. The menus are everything you could want at an adorable establishment such as this. Miniscule doodles float across the menus providing a playful sense while giving guests a visual representation of some of the items available. Everything about this place is fun, light, fresh and airy. 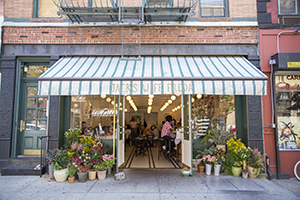 Open seven days a week, and serving breakfast, lunch, and dinner, Jacks Wife Freda is a must for spring in the city. Info: jackswifefreda.com. Bluestone Lane Experience a taste of dining down under at Bluestone Lane in the West Village. Diners will experience a feeling of sophistication as they sip on some of the best coffee found in the city. Influenced from the renowned coffee culture hub of the city Melbourne, Australia, where premium coffee is a way of life, Bluestone Lane offers New Yorkers and visitors the chance to sense culinary themes found in Australia. The menu items have a strong focus on healthy eating and light cooking, including gluten-free options. Guests will indulge dishes such as a classic Smashed Avocado served on Balthazar toast with tahini, cherry tomatoes, feta and the option to add a poached egg, bacon, prosciutto or salmon. The BL Big Brekkie includes smoked bacon, poached eggs, roasted tomato, grilled chorizo, avocado smash, sautéed kale, baked mushroom and Balthazar toast. To accompany one of the many delicious dishes, opt in for a cup of macchiato with a single espresso blended with steamed silky textured milk or the Australian classic, a flat white with a thin layer of micro-foam. 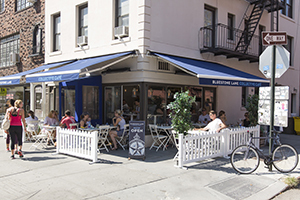 Bluestone Lane has several other locations including Dumbo, Upper East Side, and Bryant Park. Info: bluestonelane.com. 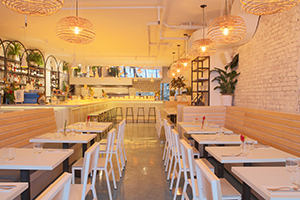 The Butcher’s Daughter Situated in the charming upscale NoLita area is a this trendy plant-based café and juice bar. 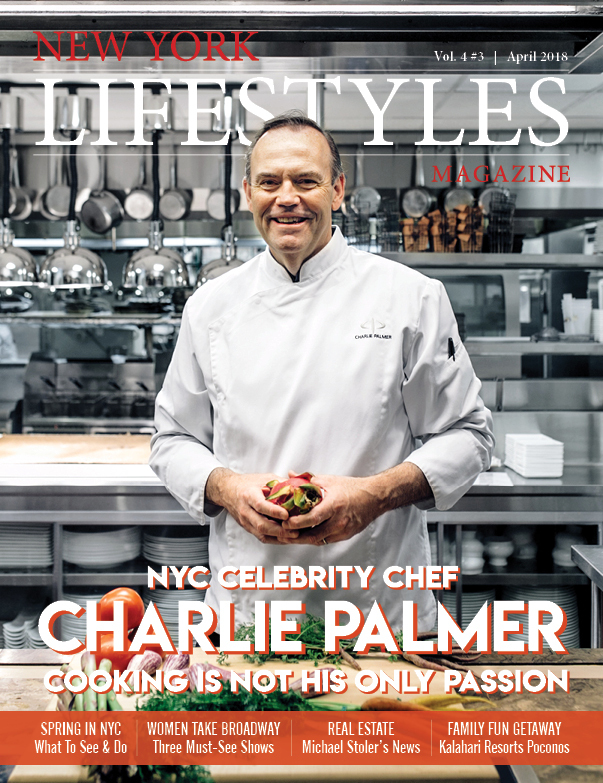 This thriving establishment takes pride in creating healthy creations that look—and taste—good. Guests are welcomed with the stark contrast of light blue and sandy wood tones, with the occasional accent of fresh greens and crisp whites floating around. The juice bar is loaded with fresh raw drinks such as Anjou Pear, Beetroot and Ginger, or Pineapple, Jicama and Lemon. The elixir shots include fresh-cut wheatgrass, liquid vitality with ginger, honey, yuzu and Echinacea tincture. As for the food, savor brunch items such as Soaked Orange Muesli, Tacos Verde, a full English Breakfast, and much, much more. The Butcher’s Daughter is open daily from 8 AM to 10 PM. Info: thebutchersdaughter.com. Two Hands Another excellent brunch spot downtown is this bright and airy café serving juices, espresso drinks, and classic brunch items. Upon arrival, crisp whites, warm lighting, and tasteful décor will greet you as you dine with friends and family. Indulge in simple and delicious dishes paired with exceptional coffee and fresh juices, perfect for the sunny days of Spring. Some menu items include healthy acai bowls, with blueberries and bananas, cacao and acai powder with almond milk topped with Granola, Coconut, Chia Seeds and Raspberries. If you’re looking for something more substantial, build your breakfast and choose from classic items such as Smashed Avocado, Bacon, Chorizo, Poached Eggs, Smoked Salmon or Feta Cheese. Be sure to try the signature Banana Bread. Info: twohandsnyc.com.